— even if you’re only Irish for the day! 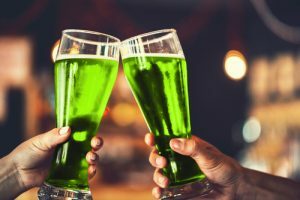 Celebrate St Patrick’s Day in Georgia’s Irish Pubs! Georgia has been proudly celebrating St Patrick’s Day for more than 150 years. Atlanta’s Peachtree Street boasts one of the country’s largest parades, hosting hundreds of parade units every year, some from as far away as Ireland itself! There’s plenty to do all over the state, from Savannah’s St Patrick’s Day celebrations to the annual Atlanta St Patrick’s Day parade. When Saturday 17th comes around there’s no better way to celebrate than by paying a visit to a real Irish pub within the Atlanta Gas & Light service area – here are our favorites. If you’re looking to get into the thick of things, Fado Irish Pub is about as good as you can get. The owners of this pub go all-in for St Patrick’s Day; and no surprise, with the parade route running right by the pub itself. In fact, they’re even putting on a 2-day block party along 8th Street for the whole weekend. If you’re committed to celebrating St Patrick’s Day just like the Irish do, then Fado’s is the place to go in Atlanta; cheap natural sourced food and the company is a gas. Celebrating St Patrick’s Day in Augusta? Get yourself down to Sheehan’s Irish Pub – try some authentic British (if not strictly Irish) scotch eggs, and wash it all down with Guinness. O’Sheehan’s is based around fine dining more than rowdy celebrations of St Patrick’s Day – if you’re looking for something more dive-y, then Tipsey Mcstumbles on the other side of town offers more of the flavor you’re looking for. The Bearfoot Tavern offers a little taste of Gaelic hospitality in Georgia. Serving a wide range of draught beers including Guinness (but also plenty of local beers, from cheap, natural Georgia IPAs to lagers and more), The Bearfoot Tavern offers a great atmosphere to enjoy your St Patrick’s Day celebrations. Live music is planned all day on the Saturday, with more bands scheduled to play during brunch on the Sunday. The perfect mix to nurse you through that Guinness and whiskey hangover. “What’s the craic?” asks Kevin Barry’s Irish Pub. This pub is set apart from other establishments by its emphasis on real Irish culture. Live music and ceili bands play almost every night of the week. There’s loads planned for the St Patrick’s Day weekend, and you can be sure you’ll get a real taste of true Gaelic culture here. You may even find something more; as their website proclaims, “you may realize you’re in a family, not a bar”. Make the Most of St Patrick’s Day!